Chandler Elementary looks like any other elementary school—children run and scream on the playground and kids eat the snow they use as a soccer ball. Yet once on the inside, a different kind of drama is playing out. About a month ago, Lisa Lederach, principal of Chandler Elementary, was anxiously awaiting a phone call from the executive director of elementary programs, Tamra Ummel, providing a “yea” or “nay” from the Indiana Education System, who was deciding whether or not Chandler’s No Child Left Behind restructuring plan should go through. Under the No Child Left Behind federal mandate, schools like Chandler that are a part of the Title I program (a program that provides money for schools with high percentages of low-income students) need to regularly meet the government’s standards. The schools need to continuously make Adequate Yearly Progress (AYP) improvements, which are determined by standardized tests. Those schools whose test results do not reflect improvements face consequences. Chandler Elementary is in its fifth year of “improvement” status, and therefore had the option of choosing from four different courses of action: replace or re-assign the staff who have been at Chandler during its sustained failure to make AYP, close the school, re-open as a charter school or make a contract with private management to operate the school. Last September, Bruce Stahly, superintendent of Goshen Community Schools, sent invitations to 50 different people to be a part of a committee to address the No Child Left Behind issues. In the end, the committee consisted of parents, administrators, community members and staff members from several area schools. “We wanted it to be more the community giving input,” Lederach said of the committee meeting. The committee met six times between September 24 and December 15 and researched several options for action. “The committee made some recommendations with extending the school day, multi-year placements [and] getting parents involved,” said Lederach. By December, the group came to a consensus that the best option would be to restructure the school. After the committee decided the restructuring option would be best, Ummel worked with eight people from the committee to write the details of the plan. On Feb. 8, Stahly and Ummel met with officials from the Indiana Department of Education to discuss the preliminary draft of the plan. Because many of the staff have not been at the school long, and therefore are not responsible for not meeting AYP, not many will need to be moved. Lederach was named principal last February, and because she held her position for less than a year before the school was deemed as a failure she does not need to be transferred. Lederach said there would be a lot of consideration in what teachers will have to transfer. The plan included steps the school will take in addition to any restructuring. “We felt that if we were going down this road [of restructuring], we knew there had to be other components in place,” said Ummel. According to Ummel, one change would be more structured and intentional home visits. Many families love their children, said Ummel, but may not know how to be supportive of their learning. This would address the problem beyond what the teacher is doing in the classroom. Ummel noted that it is a continual challenge to reach out to parents, and sometimes a language barrier makes it even more difficult. For a significant portion of students at Chandler, English is not their primary language. Chandler has a 38-percent Hispanic student population. The highest in the district is West Goshen at 47 percent. These are just the percentages of Hispanic students at the schools, not students learning English as a second language–although a portion of these students are learning English as a second language. “We can’t lose the teachers who speak Spanish,” said Lederach. Chandler currently has more Spanish-speaking teachers than any other school in the district. Diane Woodworth, assistant superintendent of Goshen Community Schools, said the problem does not lie in the capability of the teachers. The real issue is that the state government’s expectations for the students are set too high for the demographic of the school, she said. Standardized test rates are related to the social and economical levels of the students’ families, she said. 72 percent of students at Chandler participate in the National School Lunch Program, a federally assisted meal program providing low-cost or free lunches to children in public schools. Upper-middle class families provide their children with books, take them to church camps, involve them in girls and boys scouts and take them to visit parks, said Woodworth, and these experiences help to enhance the vocabulary of children. 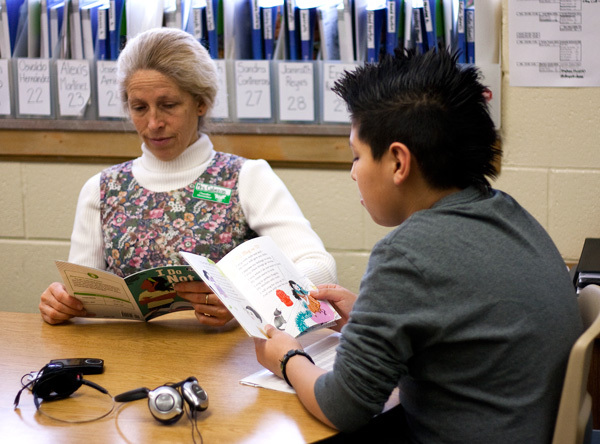 Students who have been speaking English since birth and students who have been speaking English for less than a year are given the same standardized test. “Many children are just doomed to fail,” said Woodworth. Another aspect of the proposed improvements includes a vocabulary-building initiative, where students are given vocabulary notebooks and a six-step process. Also a part of the plan is the initiative for teachers to get paid for their performance. Teachers from a certain grade have the chance to get paid extra if their students’ I-Step results show improvement. Woodworth described this initiative as somewhat painful for teachers because they are forced to teach their students based on standardized tests. Ummel said that all the strategies seek to improve the achievements of all the students. At this point, the school is just beginning to look into the specifics of which teachers will move. On Feb. 22, the school board approved the proposed plan, but the Department of Education has yet to respond. Once they get an official response, they will begin to look at transferring teachers. A list of teachers to be transferred needs to be submitted to the board no later than June 1. Ummel said they will first look for people who will voluntarily transfer. If there aren’t enough volunteers, the transfers will need to become involuntary. If people decide to leave Goshen Community Schools altogether, they will need to recruit people from outside the district. “This process can affect everyone in the school district—no one is exempt,” said Ummel, “so there is a lot of anxiety. According to Ummel, the department of education is looking for the school to have a similar balance in the experience level of teachers who are leaving and coming into the school. More than just looking at the final results, the entrance level and growth of the students needs to be considered as well, said Woodworth. Some students aren’t able to reach the highest bar because they are starting from a lower point.